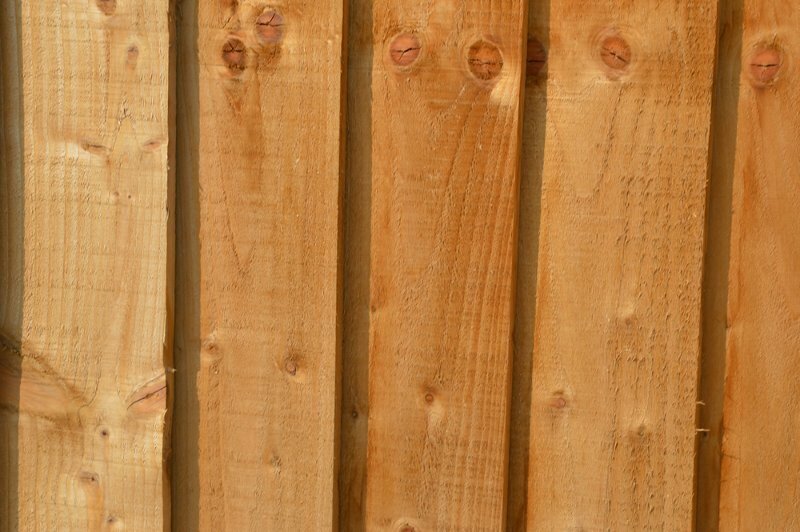 Closeboard fencing is a step up from ordinary larchlap garden panels. It is so much more robust and sturdy. We supply it in kit form which is easy to install and there are two different types. Please note: ALL of our posts used are redwood for a desired 15 – 20 years life span. Please make sure you ask for redwood posts when getting quotes elsewhere! The cheapest type is our flat system where a flat, un notched post is put in and rails nailed to the face. The featheredge pales/boards are then simply nailed to the face and sit on the gravel board on the bottom. The standard posts for this system are 100×100. The other option, and is far more common, is our V notch system. Here, 125mm x 100mm posts are used. They have three triangular shapes cut out of the face which ‘take’ the traingular arris rails. These posts also have a rebate on the top to take the counter rail / backing rail on edge which in turn has the capping rail nailed / screwed down in to it. The main advantage for the flat system is that it is cheaper as the posts are smaller but then it does not last as long as the V notch system. Any height can be purchased from us but the common heights are 1.2M, 1.5M, 1.8M & 2M. Remember that in most cases planning consent is needed if you wish to go higher than 2M on a solid/permanent fence. We also supply a concrete recessed post for closeboard fencing which works on the same principal as our V system but here the recesses are for flat rails (87mmx38mm) rather than triangular rails. In most closeboard kit situations 3M sections are supplied although we do supply longer sections of gravel board and arris rail if this is required ie..if there are problematic tree roots or hard areas of stone. The featheredge boards used are either 125mm or 150mm wide.